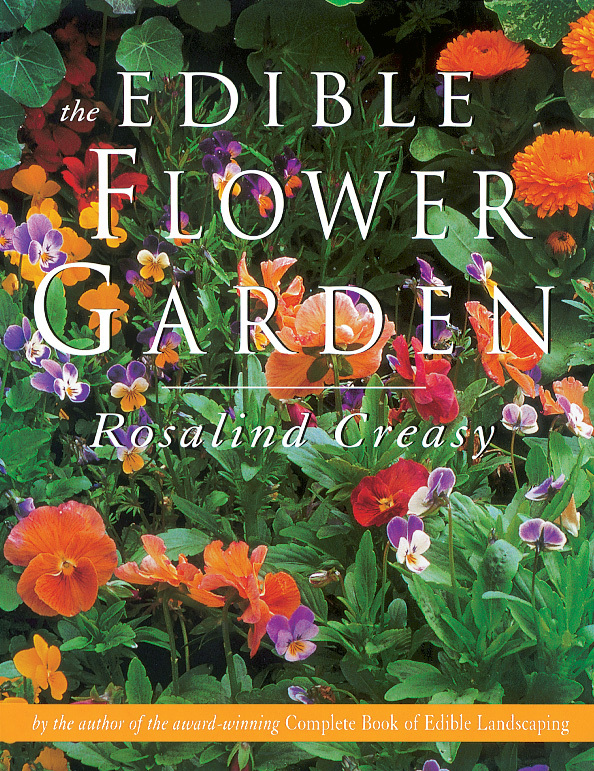 One of the best parts of this book, as well as others in Rosalind Creasy’s edible gardening series, is the recipe section. From simple sauces and salads to delicious-looking main courses and desserts, there’s something for everyone. Spring dreaming? 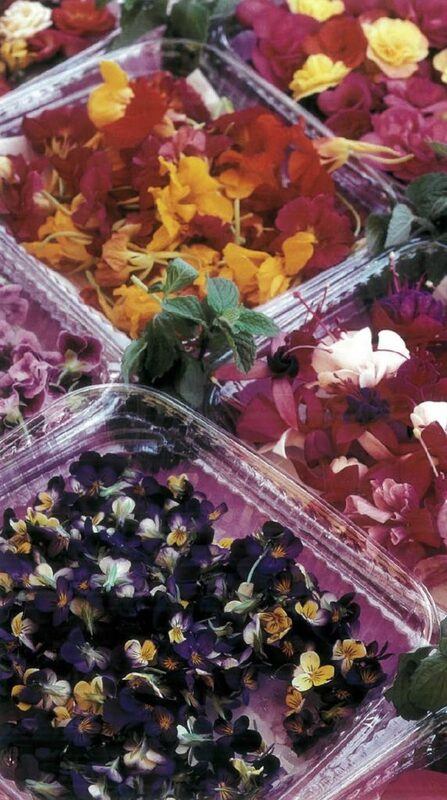 May visions of Edible Flower Canapés and Rose Petal Sorbet dance in your head ’til springtime. Gather your seed packets and tubers, I’ll meet you in the garden come May! A copy of this book was provided by Tuttle Publishing in exchange for independent, un-biased review. No other compensation was received. The Gardener’s Eden is not an affiliate of Tuttle Publishing, but is an affiliate of Amazon.com. Article copyright Michaela at The Gardener’s Eden, all rights reserved. All content on this site, (with noted exceptions), is the property of The Gardener’s Eden and may not be used, reproduced or reposted elsewhere without written consent. Do you enjoy visiting The Gardener’s Eden? You can help support this site by shopping through the affiliate-links here. A small percentage of each sale will be paid to The Gardener’s Eden, and will help with site maintenance and web hosting costs. Thank you! While out enjoying a morning stroll around the garden, taking in a blissfully cool and misty start to my day, a few flower stalks and juniper branches caught my attention by snapping at my ankles and tickling my knees. Ah, the tumbling jumble of summertime garden chaos! I do love a lush and laid-back garden, but every year at about this time, I embark upon a bit of disciplinary activity in my flower beds and shrub borders. After all, there’s a fine line between beauty and beast in the garden! 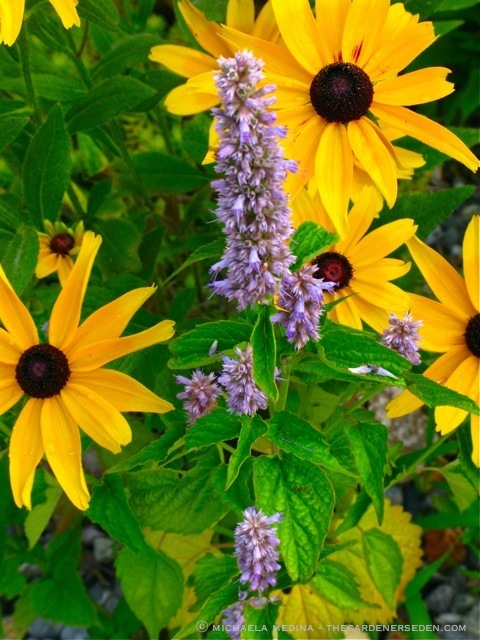 Agastache, a bird, bee and butterfly favorite, always benefits from a mid-summer haircut. Shearing the spent flower heads from this plant now encourages a second wave of bloom later in the summer. Because this is an aromatic plant, it’s quite a pleasant job. But try to do this very early in the day, in order to avoid disrupting foraging bees. Rudbeckia hirta ‘Becky Mixed’ is still in full bloom on the Wildflower Walk. As the flowers fade, I will leave most of the seed heads standing for finches and other small birds, as well to enhance the winter-garden. But if flower stalks fall into the path, tripping or whacking passers by, I will cut them for vases to keep the walkway clear. 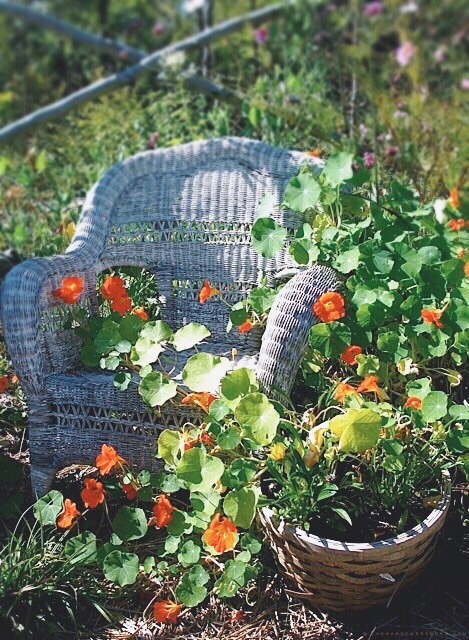 If you are relatively new to gardening, probably the most important thing to remember is that getting to know the plants you care for —their identities, growth habits and blooming routines— is key to making them look their best in your garden. Think like Edward Scissorhands for a moment and imagine vegetative growth as hair. Ironing curly hair straight may be fun once in awhile, but when it comes to day to day style, the best looks work with nature. What’s true for people is also true for plants. 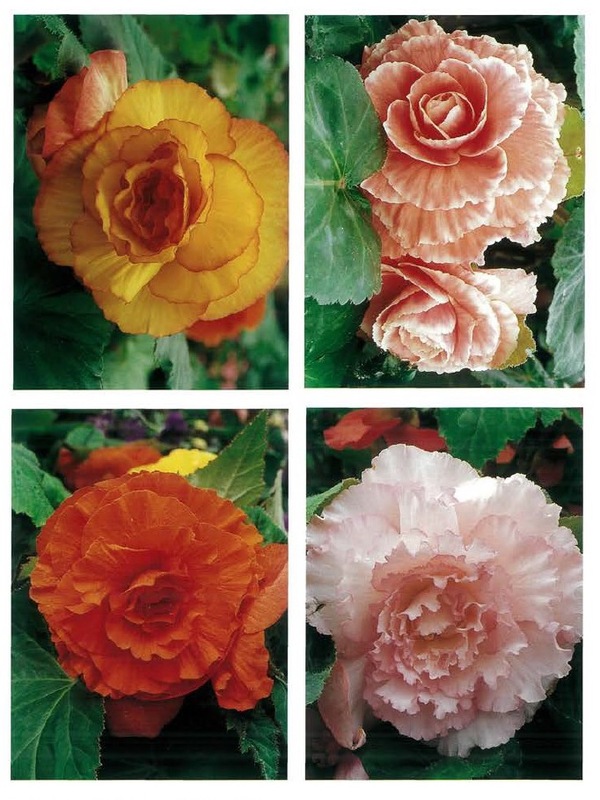 If you need help identifying the plants in your care, a good encyclopedia —like this one from the American Horticultural Society— is a great garden-library investment. 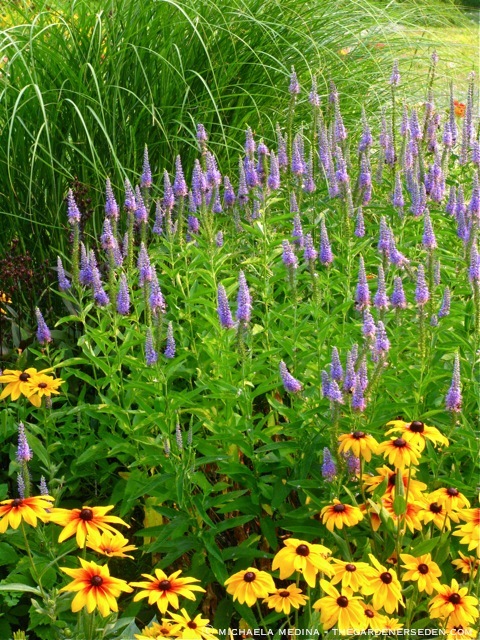 Veronica spicata –a pollinator favorite– is a long-blooming perennial. 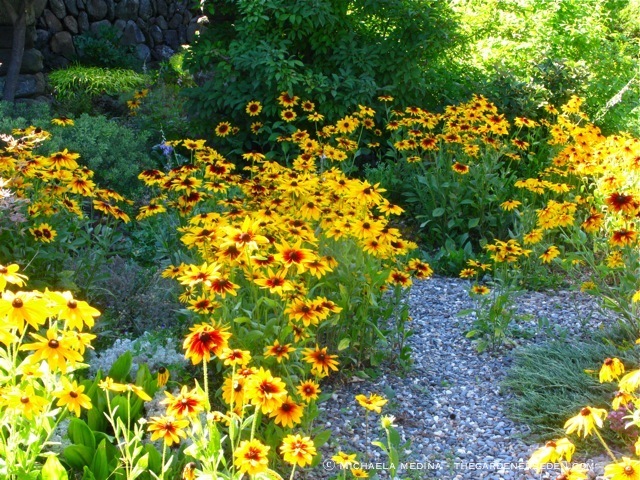 Because of its front-and-center location in this border (backing up Rudbeckia hirta and dancing with the slender blades of Miscanthus sinensis ‘Morning Light’) this plant is a very good candidate for mid-season maintenance. Shearing the top blooms off this cultivar, V. spicata ‘Sunny Border Blue’, will help keep the plant tidy, and encourage another full wave of bloom in a couple of weeks. I try to leave flower heads standing as long as possible in the garden, even if they seem a bit faded. Flower nectar and pollen still provides sustenance to garden guests —like this bumble bee— even though blooms may be past their prime. Later, seeds of this Echinacea, and many other flowers, provide late season food for finches and other small birds. When cut back after flowering, Geranium ‘Brookside’ will look tidier and often produce a second, if slightly less lush, wave of bloom in autumn. 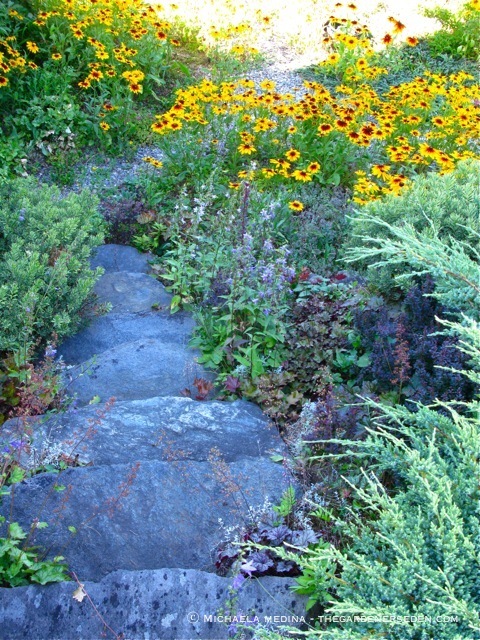 Learning to work with plants and maintain an attractive garden is a life-long process for all gardeners. Most experienced green thumbs are happy to share their knowledge, and many local garden clubs, botanical gardens, greenhouses and nurseries offer free or low-cost workshops and seminars on garden maintenance. When working with perennial gardeners at all experience levels, I often recommend two excellent books for further study and reference. 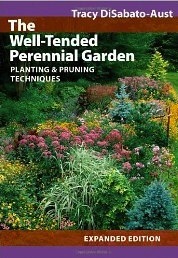 First, The Well-Tended Perennial Garden by Tracy DiSabato-Aust (pictured and linked below) is a classic how-to and when-to manual for every gardener’s bookshelf. 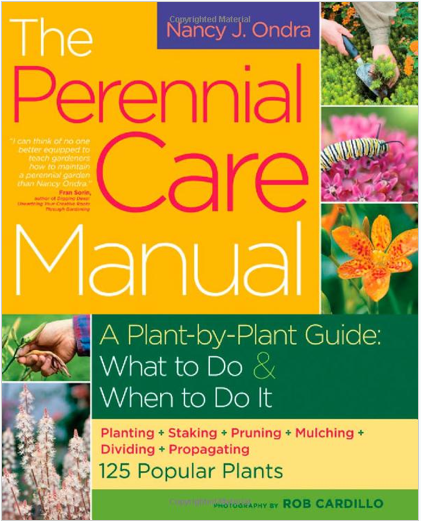 And last year, while reviewing gardening titles for Barnes & Noble, I discovered Nancy Ondra’s The Perennial Care Manual (also pictured and linked below) which I now consider the definitive plant-by-plant guide (includes an encyclopedia with many of the more popular perennials) to perennial maintenance. The macro-photos in this book include pruning details, pest ID shots and clear pictorial guides to division, propagation and more. This book would make a great gift for new gardeners, mid-level perennial enthusiasts and experienced horticulturalists alike! Photographs and Text ⓒ Michaela Medina/The Gardener’s Eden. All photographs, articles and content on this site, (with noted exceptions), are the original, copyrighted property of The Gardener’s Eden and may not be reposted, reproduced or used in any way without prior written consent. Contact information is in the left side bar. Thank you! Do you enjoy The Gardener’s Eden? You can help support this site by shopping through affiliate links (including Amazon book links). A small percentage of each sale will be paid to this site, helping to cover web hosting and maintenance costs. Thank you so much for your support! In search of inspiration for your next creative project; pattern, form or color play? Sometimes, you needn’t look further for fresh ideas than your own backyard! While out admiring the blooming butterfly weed in my Wildflower Walk yesterday, I happened to notice five examples of nature’s bold artistry on one garden plant. 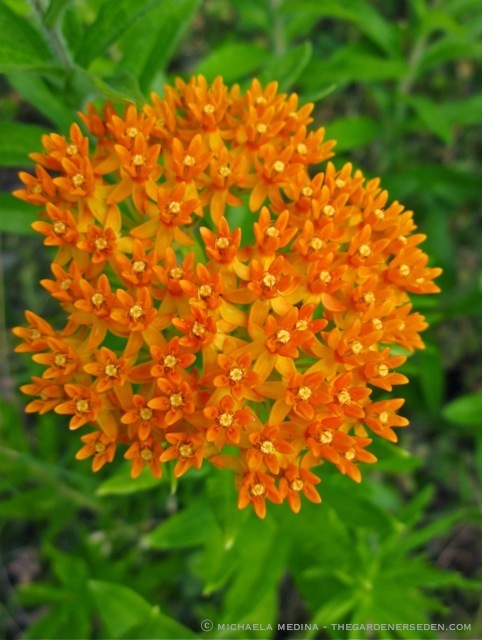 Asclepias tuberosa —as our North American, native butterfly weed is known in the botanical world— blooms in beautiful clusters of bright, citrus-punch orange. The tiny, nectar-loaded blossoms are popular with pollinators of all kinds; including bees, butterflies —like the fritillary pictured below— and hummingbirds. 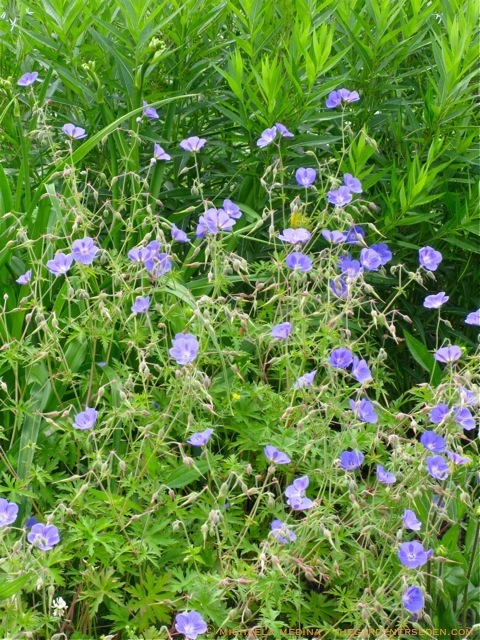 But other parts of this plant serve important purposes to wildlife as well. 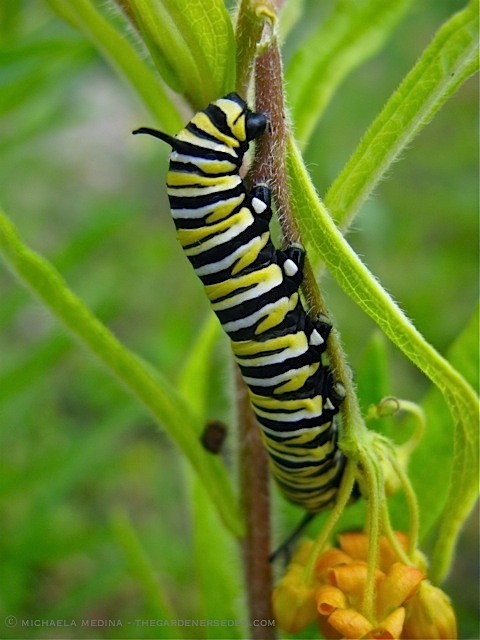 The leaves and stems of both butterfly weed and milkweed —filled with sticky sap— provide sustenance to butterfly caterpillars; including the boldly striped larvae of the beautiful Monarch Butterfly. Asclepias sap is toxic to many of this caterpillar’s predators, providing the insect with natural defense. 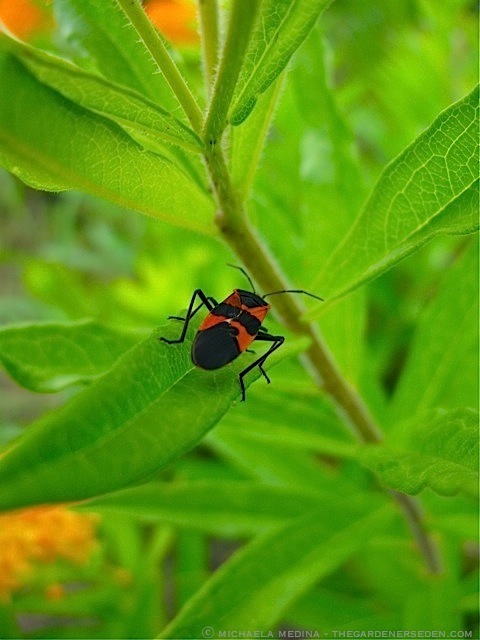 Small Milkweed Bugs —colored in bold red and black patterns— also look to Asclepias species for food; feeding upon the seed of this important native plant. Lady luck must have been walking with me yesterday as I strolled through the garden, because I happened upon not only eye-popping, orange blossoms, but wild black & yellow stripes and bold, modernist patterns all on one plant … talk about artistic inspiration! 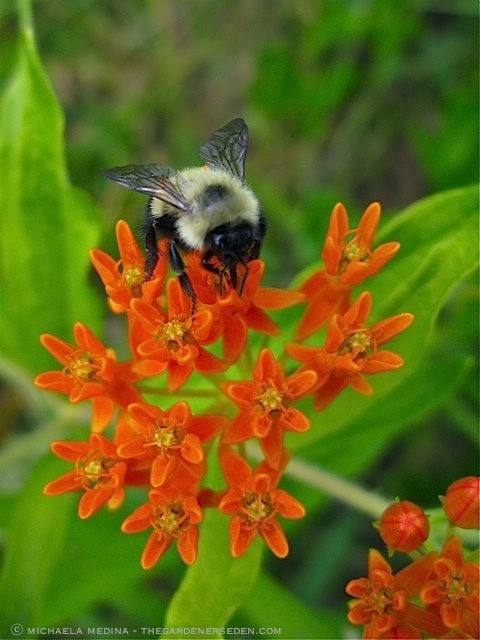 Last summer, I featured this beautiful, long-blooming summertime flower —Asclepias tuberosa— in a plant profile. 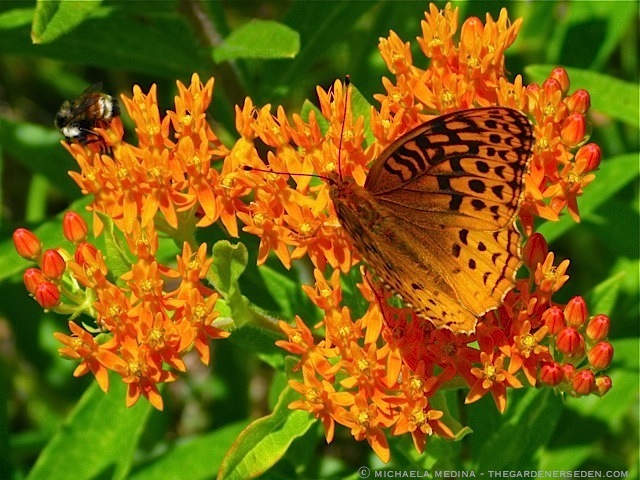 You can view additonal photos of butterfly weed in flower, and find more about this wonderful garden-worthy member of the milkweed family, by clicking back to that profile post here. A Monarch Butterfly Caterpillar (Danus plexippus) in my garden, munches on its favorite host-plant: Asclepias tuberosa (Butterfly Weed). I am more than happy to plant plenty of flowers for both of us! 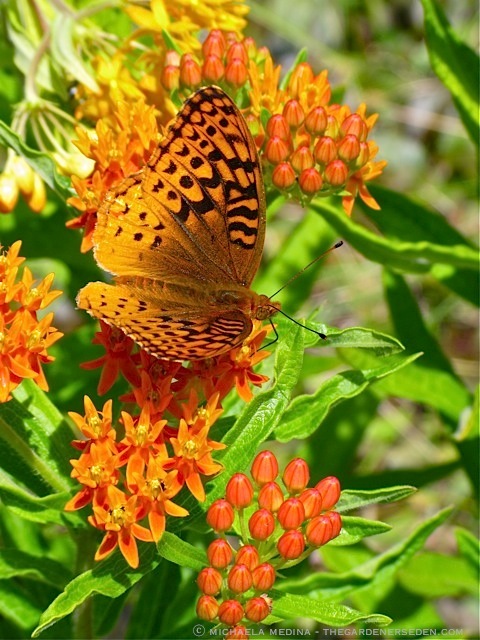 Fritillary Butterflies Flock to the Nectar in Asclepias tuberosa – No Wonder It’s Commonly Called Butterfly Weed! 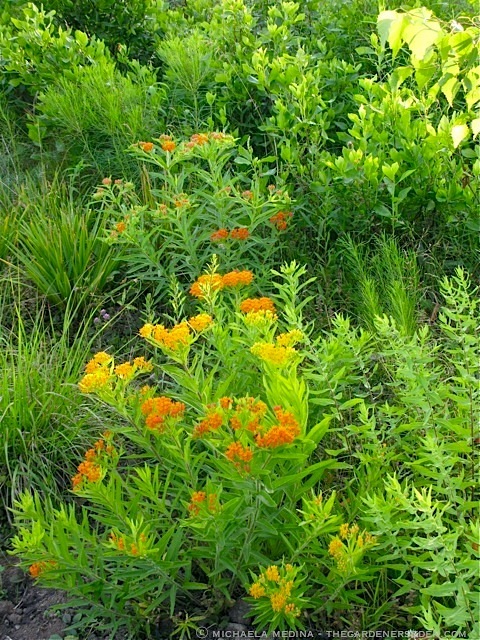 Asclepias tuberosa makes a great garden plant: pictured here along the Wildflower Walk with Amsonia hubrichitii, Asters, Pennisetum alopecuroides ‘Hameln’ and Clethra Alnifolia ‘Ruby Spice’. Try it in combination with blue and violet flowers for a bold contrast. Or cool things off with a bit of silver, and white! 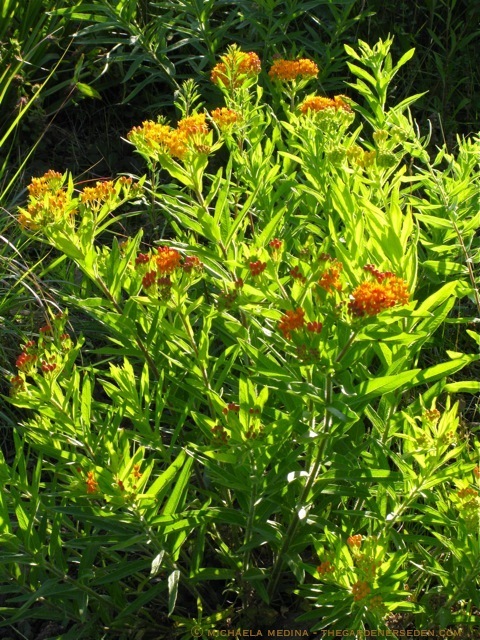 To read more about Asclepias tuberosa and its cultural preferences click here. Do you enjoy The Gardener’s Eden? You can help support this site by shopping through affiliate links. A small percentage of each sale will be paid to this site, helping to cover web hosting and maintenance costs. Thank you so much for your support! Out early in the garden this morning, I stopped to photograph the Ozark Bluestar (Amsonia illustris), blooming along the path. 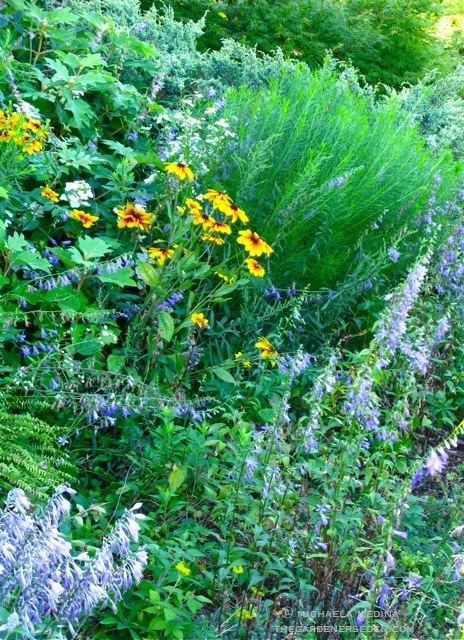 I wanted to share springtime images of this beautiful, native perennial, which I often feature in my garden designs. In autumn, Amsonia turns chartreuse, followed by a gorgeous golden yellow/orange color (see previous post for photos), but it’s also beautiful throughout the growing season; with lovely blue flowers in May/June and fine, feathery green foliage. I grow various Amsonia species and cultivars in my own garden, and as I stopped to focus in on a flower, I was treated to a magical surprise. A hummingbird, butterfly or bee? No, actually this lesser-known pollinating insect is an amazing Hummingbird Moth (Hemaris thysbe); though many people mistake this master of disguise for a hummingbird, hence the common name. 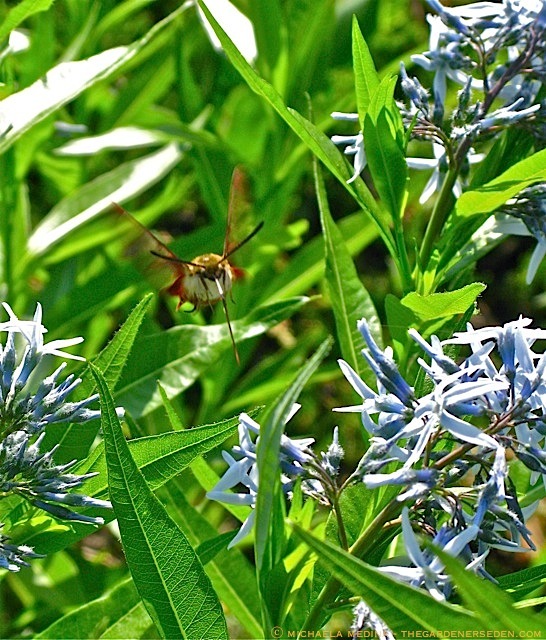 The Hummingbird Moth moves very quickly from flower to flower, gathering nectar with its long proboscis. Although I have tried to capture a photo of this fast-moving insect many times, I have never been successful until this morning. And wouldn’t you know it, the opportunity occurred by complete accident! 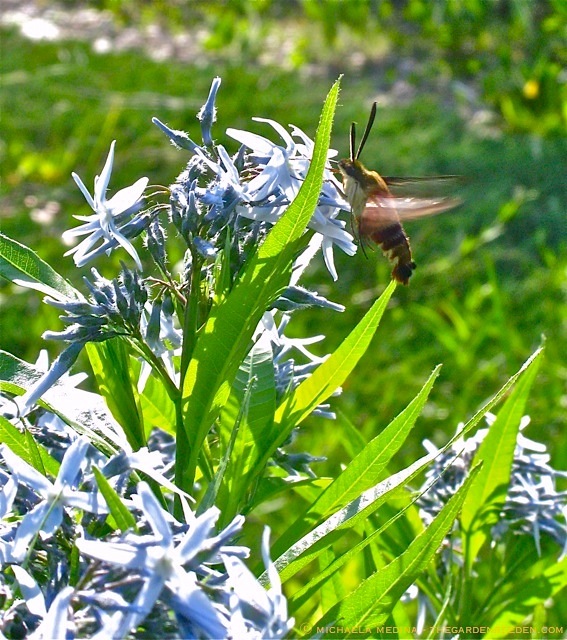 Adult Hummingbird Moths feed on the nectar of many native and non-native flowering plants; including Beebalm (Monarda), Phlox, Lilac (Syringa), Amsonia, Blueberry (Vaccinium), and other blossoms attractive to their fellow pollinators, the butterflies and bees. The Hummingbird Moth is a member of the Sphinx Moth family, but although its larvae (a small green hornworm, with yellow legs) closely resemble the tomato hornworm/Five-Spotted Hawk Moth (Manduca quinquemaculata) and tobacco hornworms/Carolina Sphinx Moth (Manduca sexta) —notorious vegetable garden pests, which I wrote about last year in this post (click here)— Hummingbird Moth caterpillars feed non-destructively on the foliage of native shrubs and trees; including viburnum, cherry and plum (Prunus), snowberry (Symphoricarpos), hawthorn (Crataegus) and honeysuckle (Lonicera). So, should you happen to see small green “hornworms” on your ornamental trees and shrubs, don’t harm them! First, look them up here on Bugguide.net, as they are likely to be the larvae of our beautiful pollinating friend, the Hummingbird Moth! Magical creatures like the Hummingbird Moth count on us to help them by avoiding the indiscriminate use of pesticides (even organic pest controls, including Btk). Article & Photographs ⓒ Michaela at The Gardener’s Eden. All photographs, articles and content on this site, (with noted exceptions), are the original, copyrighted property of The Gardener’s Eden and may not be used, reproduced, republished or reposted without prior written consent. Contact information is in the left side bar. Thank you! Do you enjoy The Gardener’s Eden? You can help support this site by shopping through affiliate links here. A small percentage of each sale will be paid to this site, helping to cover web hosting and maintenance costs. Thank you so much for your support! 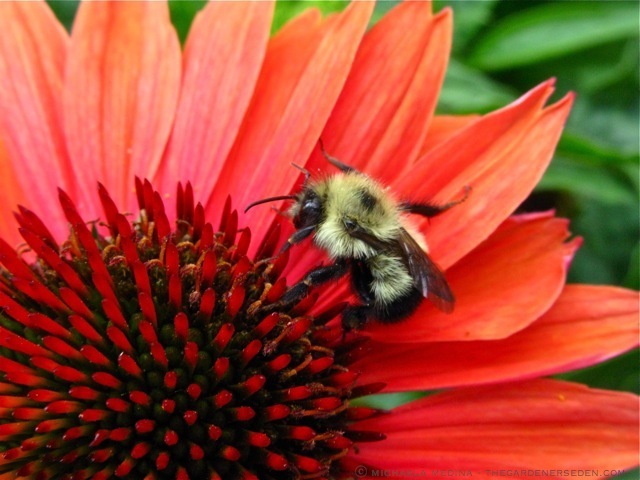 You are currently browsing the Pollinating Insects category at The Gardener's Eden. The Gardener's Eden is an affiliate of the select, fine companies linked below. You can help support the Gardener's Eden, at no additional cost to you, by shopping through the links here. Thank you ! To leave a comment, click any article title and scroll down to the bottom of the page to reveal the hidden form. Comments may be held for moderation to prevent spam. Want more interaction? Join The Gardener's Eden community page on Facebook or @michaelaineden on Twitter for daily photos & updates. Click on "Follow Me" above to subscribe. Thank you and Happy Gardening! Try typing a key word into the handy little search box below. New to this site? Click on the "View Random Post" button below to see what you have missed!